'Blackthorn Strain' is a carefully selected seed strain, with delicate pink flowers backed with pink and green, the stems, petioles and often the anthers are an enchanting ripe berry rose. The saw-toothed foliage is pewter-blue above, burgundy-grey beneath. 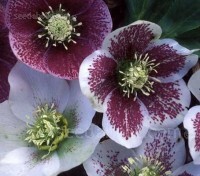 Based on hybrids bred by the doyenne of the Hellebore world, Helen Ballard, these must be some of the finest and most beautiful of the race we have to offer. 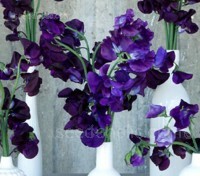 Large flowers are produced in a variety of colours from dark purple to white - often extravagantly mottled and marked. 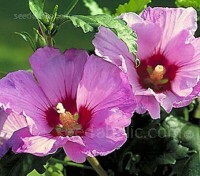 Hibiscus syriacus is a very beautiful, hardy deciduous shrub with a lush tropical appearance. Its numerous blooms have a very distinctive form. Luxuriant large trumpet-shaped flowers each with prominent white stamens, it flowers prolifically over a long summer and continue to decorate the bushes until early autumn. 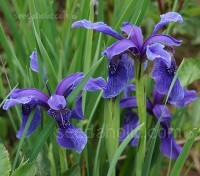 Bulley's Iris, Sino-Siberian Iris, Beardless Iris. 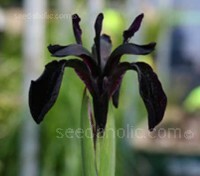 Iris bulleyana is a classic species Iris from western China. 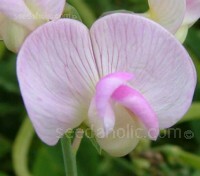 It belongs to a small group of oriental species which are entirely hardy and are of great value to the gardener. 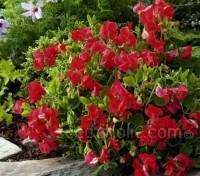 The plants are successful in any moist garden soil. 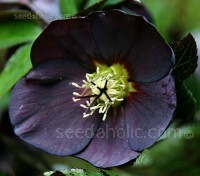 Flowering from June to July, the blooms with mid purple flowers and dark purple veins. 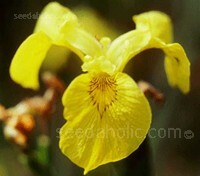 Yellow Flag Iris is a common and widespread native plant in Britain. This good-looking plant is a wetland plant that is especially showy in bloom and has been transplanted into well-watered gardens all over the world. 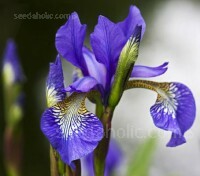 Iris versicolor is one of the few species in garden cultivation. Although happiest at the waterside the plants will also perform well under average to moist border conditions. Flowering from May through to July, each stalk produces up to five violet-blue flowers with ruffled petals and bold purple veining. 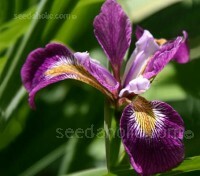 'Kermesina' is an attractive and popular cultivar of Iris versicolor. 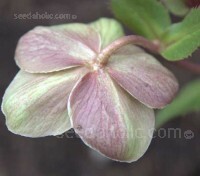 Flowering from May through to July with claret-purple flowers with ruffled petals and bold purple veining. It may be grown in shallow standing water or moist shoreline soils and suitable to be grown in constantly moist humusy soils of a border. 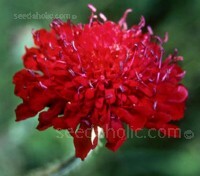 Knautia macedonica has been hugely fashionable for years and is likely to remain so for many more. This lovely and versatile perennial blooms from late spring to autumn with dark-crimson, richly glamorous pompoms. Established plants produce literally hundreds of blooms in one season. 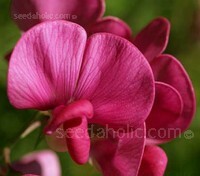 This everlasting or perennial sweet pea bears delicate masses of blooms in pinks, soft whites and mauves. Flowering right through the summer, from June to September, it has one of the finest cut flowers available. 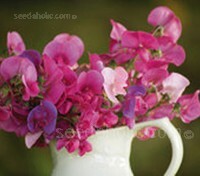 This stunning sweet pea has clusters of delicate pink flowers from June to September. It was introduced before 1635 and became popular in gardens in the early 1900s, often grown over a floral cage - very fashionable in Victorian England! Furled clusters of pristine crimson-rose flowers bloom at the top of arching winged stems. 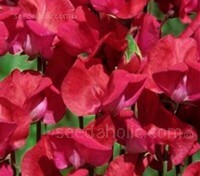 This perennial relative of the annual sweet pea is justifiably popular; it will bloom throughout the summer months. 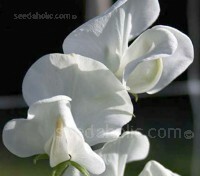 This perennial Sweet Pea has masses of gorgeous pure white flowers. Easy to grow, it requires little care and will quickly cover arbors, trellis or fences with perfect foliage and tresses of flowers all summer. A stunning flower that comes back year after year. 'Matucana' was first introduced into this country from Sicily in 1699, this delightful heirloom dates back at least three centuries, highly valued for its wonderfully strong, sweet scent as well as its brilliant bicoloured blooms of richest purple and violet . Supersnoop is a dwarf bushy variety with bright coloured beautiful fragrant flowers. Early booming and heat resistant, they grow to only 45 to 60cm tall. This excellent sturdy spreading variety needs little or no support. It wends its way through the garden or over the edge a planter just beautifully. .
‘Villa Roma Scarlet’ is the first variety of sweet pea to win the coveted Fleuroselect Gold Medal. The judges across Europe were impressed by its very bright colouring, its excellent performance in the garden and its ability to continue blooming through the heat of summer. Extra early, extra large blooms are the feature of this award winning sweet pea, an excellent choice for early spring colour and the best strain for producing early cut flowers. 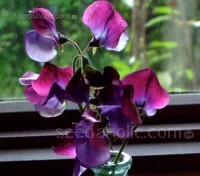 If you have never seen this kind of sweet pea on long stems before, and don’t quite understand what all the fuss is all about…they are marvellous …guaranteed to make you fall completely in love with them. 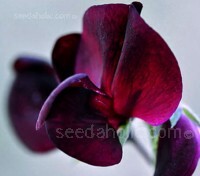 Lathyrus odoratus 'Black Knight' is very handsome dark purple-maroon heirloom sweet pea with generally three, sometimes four well shaped flowers per stem. Introduced by Henry Eckford in 1898 it was exhibited by Eckford at the Crystal Palace Exhibition in 1900. Without doubt, it is one of the best of all the grandiflora varieties. 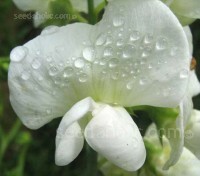 Lathyrus odoratus 'Dorothy Eckford' is an outstanding pure white heirloom sweet pea introduced by Henry Eckford in 1901 and named after his daughter. 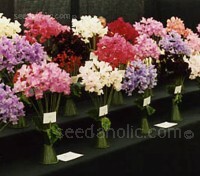 An important commercial cut flower, it has regained favour recently due to its beautiful form and perfume. 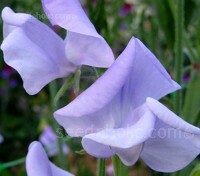 True clear blues are rare in sweet pea flowers. 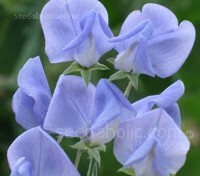 Lathyrus odoratus 'Flora Norton' is one of the clearest blues available. 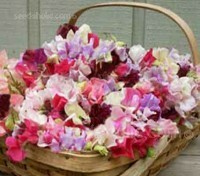 With wings large in proportion to the standard and blessed with the most superb fragrance, it is one of the loveliest of all the grandiflora sweet peas.